This time it's the 2019 Corvette Grand Sport that will be pressed into duty, decked out in Long Beach Red Metallic with dual silver racing stripes and the requisite special livery. And not for the first time, either. Chevy has provided the pace car 29 times since a Fleetmaster Six convertible lead the procession in 1948. And of those 29 appearances, the Corvette has performed the function 15 times. In fact, General Motors has furnished the pace car for the past 22 years running, first with Oldsmobiles and now with Chevrolets non-stop since 2002. 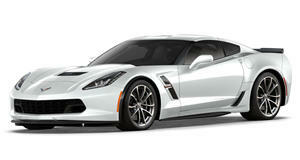 Trading off with the Camaro, the C7-generation Corvette has served the purpose four times already, with the Grand Sport having already appeared in 2017 (pictured in white, followed by the ZR1 last year and preceded by the Z06 in 2015 and the Stingray in 2013). What's more is that a fleet of 33 Stingrays will also parade dignitaries through town in the run-up to the race, marking the first time that Corvettes will serve as both pace and festival cars since 2007.